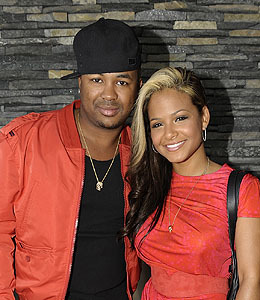 Songstress Christina Milian will tie the knot with her beau, producer and recording artist The-Dream. Milian confirmed the engagement to Us Weekly, saying, "We don't have plans yet -- but it hasn't [already] happened, that I can confirm," Christina told the magazine of her upcoming wedding, adding, "We just want to have our closest friends and family there; it's not going to be too big." The-Dream, who proposed to Christina with a monster six-karat ring, also dished about the couple's baby plans. "I love kids, and Christina loves kids probably more than I do," he revealed, adding that while the couple is focused on working right now. "I think when you're a female in this business, it's kinda hard to do the natural thing that you want to do," he said. "You have to do your work -- then whenever she makes that time for herself -- she'll make that time [to have a baby]. In the next couple of years, there'll be something around." This will be the first marriage for Milian. The-Dream split from his first wife, singer Nivea, in 2007.